Have a look at the keys and it will take you back to the Victorian age when everything and anything carried beauty with it. Not only is it good to look at, but is very solid and reliable too; it comes with set of two keys. 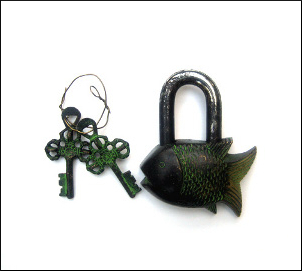 The days of using a conventional lock and key may be behind us, but not very often would you find a lock & key so aesthetically designed. Have a look at the keys and it will take you back to the Victorian age when everything and anything carried beauty with it. Not only is it good to look at, but is very solid and reliable too; it comes with set of two keys. This antique work of art can be used as a paper weight too.